Making a photo album for 2016 was one of my goals on my 28 in 28 list. It was one of the last things I finished of this list. 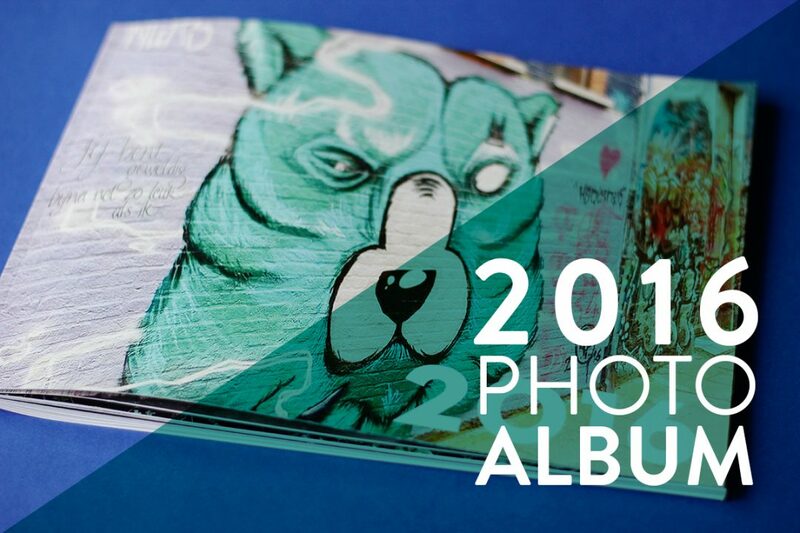 Creating a photo album with pictures of a whole year is a bit of an undertaking, so let me guide you through my process (and show off some pictures of my shiny new photo album). Putting my photo album together took less effort than I had expected. I keep my photos sorted according to the month they’ve been taken, so it was easy for me to find everything and put it in a chronological order in the album. I did some research before putting the album together and decided to use Pixum for printing my photo album because it had the cheapest printing options. I also used the software provided by Pixum to put the album together. I made a couple of layouts that I would re-use throughout the album and filled these with the pictures I wanted to use. When I figured out which pictures I wanted to use in the album I gathered them all in a new folder and started editing them in Photoshop. This was the longest and most boring part of creating the photo album, but in the end, I believe it was worth the extra hassle. The extra hours I put into editing my photos were worth it because I absolutely love how the printed photo book looks. In the past, I once made my own photo book with Instagram pictures, but this photo book is something else. Apart from the city-trips I did with my boyfriend last year, I also added a lot of random (Instagram) pictures. When I’m flipping through the pages of the photo album I love seeing those, seemingly insignificant, pictures pop-up and remembering what they stand for. I also added some pictures from cool blogger events or challenges I did during the year. As a finishing touch I also put in a lot of the tickets, flyers and other titbits I collected during the year. They make the photo book a bit bulkier, but now it’s even more an exploration when you flip through it. So yes, did I say I love this photo album? Because I absolutely do! I’m already looking forward to creating my album for 2017 and who know, maybe I’ll finally start working on my album for our trip to Russia from a couple of years ago (1200 pictures to sift through, though). I hope you liked this quick view into my 2016 photo album. Do you still print pictures? Have you ever made a photo album? Wauw, zo mooi! Hier ook héél veel foto’s van de afgelopen maanden, en ik zou graag een foto-album maken van Juliette haar eerste levensjaar. Maar ik zie zo op tegen het sorteren en selecteren van foto’s! Ik ga er eens werk van maken, overal een beetje tussendoor :-). Hopelijk wordt het even mooi als jouw album!